As a follow on to my earlier post about the action threatened by Jaimie Fuller of SKINS against the UCI, I see further news which can only add to the problems the governing body of world cycling must face, together with its embattled leaders, Pat McQuaid and Hein Verbruggen. The UCI announced yesterday that, as a result of receiving a file from the Italian public prosecutor, it has now commenced an investigation into “race fixing”. The investigation concerns allegations that Olympic champion Alexandre Vinokourov of Kazakhstan bribed Russian Alexandre Kolobnev to win the 2010 Liege-Bastogne-Liege race. The Corriere della Sera newspaper on Saturday alleged that Vinokourov agreed to pay Kolobnev 150,000 euros for the win which was the Kazakh rider’s biggest victory since his return from a two-year suspension for testing positive for blood doping on the 2007 Tour de France. 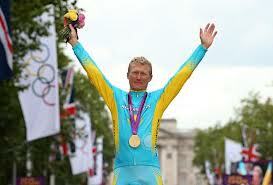 Vinokourov has now retired, following his Olympic success and has been appointed Astana team manager for the 2013 season. The concept of “race-fixing” is not unknown in cycling and indeed forms part of the team and individual strategy in Tours and in one-day races too. For example, where two or more riders break clear of the peloton and the race or stage victory is between them, it has been common for the riders to agree to share the prize money amongst them, allowing the race to the finish line to be unaffected by financial considerations. Alternatively, in a stage race, a rider who is high in the General Classification, who finds himself in a two man breakaway with a rider who is not a threat for the overall prize, might agree to allow the lower ranked cyclist to take the stage win in return for not trying to break the other one. These might be seen, to some extent, as against the spirit of the event, although as far as I am aware they are not against the rules, but clearly an offer of 150,000 Euros does not fit either of those scenarios. Doping has been the scourge of cycling for many years. However, whilst “race-fixing” has not been an issue very often in the sport, it is of course the one which almost destroyed international cricket a few years ago. It has also been a persistent spectre in tennis, with the resultant loss of confidence of some spectators in the sport. Whilst Messrs McQuaid and Verbruggen battle with the forest fires sparked by the Armstrong debacle, they must feel sick to their stomachs that this has now landed on their desks too. It involves a high profile cyclist – the reigning Olympic champion no less, a former winner of the Vuelta, and manager in 2013 of one of the leading teams. It is hard to imagine what else could happen to drag the reputation of the UCI further through the dirt … no, it is perfectly possible to imagine what could do that. However, all fans of genuine sporting competition will hope that the rot is now stopped, and that, as time goes on fans can watch the amazing feats of professional riders without wondering who in the peleton has been taking what, and whether or not the result of the race is fixed even before the cyclists sit in the saddle. This has been happening in the sport for years, especially in the Grand Tours. Robert Millar lost the Vuelta one year because another team paid money to a third team. I would say that it is far less prevalent now than 30 years ago, but favours are still done in the peloton. Deja vue! – and not just in cycling. Is the “Black Death” of world sport being uncovered? Which disease ridden sport next?